Sigmund Mifsud, Executive Chairman of the Malta Philharmonic Orchestra, Joven Grech of Tenishia and Jason Micallef, Chairman of the Valletta 2018 Foundation during the TEMPO press event held this morning. 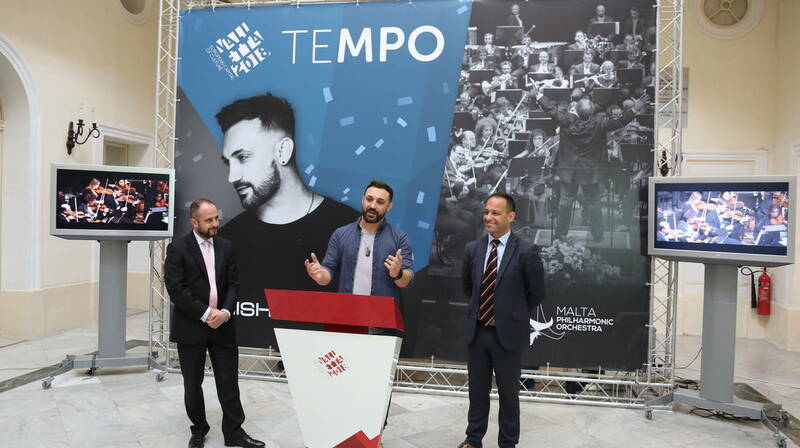 TEMPO, the closing concert of the Valletta 2018 Opening Celebrations with Maltese international DJ Tenishia and the Malta Philharmonic Orchestra will be kicking off on the 20th January at Pjazza San Ġorġ at 11:30pm. The concert, directed by Sigmund Mifsud, is a journey into electronic dance music starting from the 1970’s onwards and includes 17 iconic tracks that have shaped the genre of electronic dance music throughout the years. The Malta Philharmonic Orchestra will also be lending its sound to the set list, which includes the likes of Depeche Mode, Daft Punk, Faithless and Paul van Dyk, amongst others. The tracks have been completely reworked and reproduced to incorporate both synths and acoustic instruments, resulting in a unique musical fusion. The concert brings to an end the Erba’ Pjazez Opening Festivities for the European Capital of Culture year. Performances for the Opening will kick off at 7pm and will run on the hour, every hour, with the last performance taking place at 11pm, which will be followed by TEMPO. A week-long festival is also being planned in the run up to the Opening Celebrations, starting on the 14th January and running till the 21st January.